Wado Vale-Tudo: CARD do Black Trunk Fight 1!!! 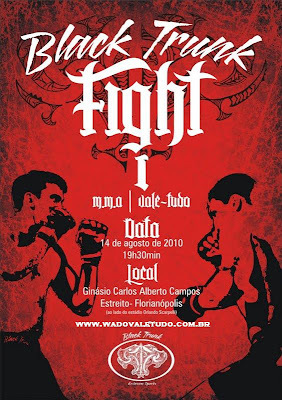 JADYSON COSTA (JADYSON COSTA FIGHT TEAM) VS "À DEFINIR"
GABRIEL GIGANTE (CHUTE BOXE) VS "À DEFINIR"
Contatos: WADO (48 / 8404-1340) ou ALESSANDRO (48 / 9101-9446 ou 9646-8489). Fontes: Site "Black Trunk" & Blog "Black Trunk"!